Tonight most of my knitting time was taken up by setting up my new TV stand and desk and moving my computer. On Sunday I went to IKEA and bought a TV stand since my TV was precariously perched on top of my DVD player which was on top of the cable box on a little table narrower than the TV. Unfortunately my TV is very small by modern standards, so it was a bit tricky to find a stand small enough. Then a friend was getting rid of a desk which is much larger and nicer than my desk was, and since I switched from a laptop to a desktop a while back, I thought it would be nice to upgrade my desk. So tonight after work I assembled furniture and moved my computer to my new desk. The living room “craft” area now has the loom instead of my computer, and my new desk is in my bedroom. The only problem here is that the router and cable hookup are in the living room, and my computer is in the bedroom and doesn’t get WIFI. But an $8 dongle will solve that issue, so soon we’ll be all set. Until then, I’m blogging from my iPad. The socks are continuing, and I’m still hoping to get the Space Monkeys and Rhinebeck socks finished before midnight tomorrow. Wish me luck! I have a feeling work might get in the way a bit. Tonight I spent my time with people who don’t knit. This is actually a pretty rare occurrence, for me. The evening was spent at The Hurricane, a local bar / restaurant that will sadly be closing at the end of the year. I have memories of going there in high school with my older car-driving friends. It’s a place with quite a few fun memories. Tonight I went there to meet up with a bunch of metal guys and take over the jukebox. We talked metal, and played metal songs all night. It was really great fun, but no knitting was accomplished. Of course, I knit for a good portion of the day at work but didn’t take any pictures of my shop project. This post has almost nothing to do with knitting, but a lot to do with me. And I know a lot of people say that. I love pretty much all animals. Not mosquitoes, because I have a bad reaction when they bite me, but my love extends to animals most others don’t like much. I love fish, rodents, reptiles, even insects. When I was a little kid, I came up with the idea of being a vegetarian without even knowing that such a thing existed! All that is the necessary preface to the following story, in which I become a chicken rescuer. One of the women in my knitting group was going on a weekend trip, and I agreed to take care of her chickens. I actually really like chickens, and had a beloved Bantam rooster, Bitsy, as a pet when I was younger. Early Sunday morning I went to feed the chickens I was caring for and let them out into their yard. As I was walking home with my bag full of eggs, I walked by the doorway to an empty storefront on the main street of my Seattle neighborhood, and saw a strange bird out of the corner of my eye. In fact, it was a chicken. 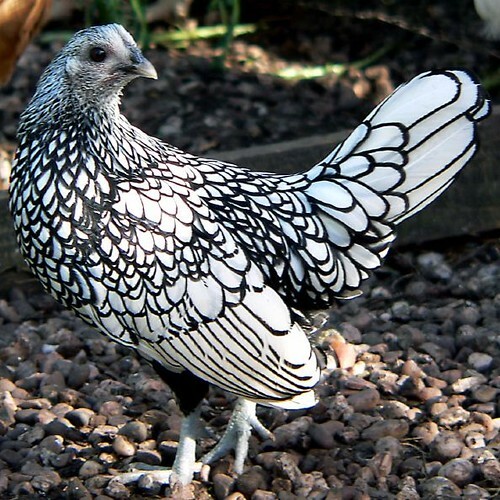 A very small, very fancy* chicken. She was also very scared. I stood there for a moment wondering what I should do. I couldn’t just leave the helpless scared chicken there. She was obviously lost, and on a busy street with a lot of foot traffic and dogs. But how was I going to rescue this chicken while walking down the street? I didn’t even have my purse, just a Ziploc bag full of eggs from the previous chickens. I reached out to pet her and she let me, obviously this was someone’s chicken. So I did what any animal-loving Seattleite would do – I walked into the Starbucks two doors down and asked for a cardboard box to rescue a lost chicken. Then I returned, put my bag of eggs and the wayward chicken in the Starbucks box, and took the Metro bus home. Luckily the chicken was very quiet, and no one noticed the woman riding the bus with a chicken in a box. Once at home, I cleaned out one of my cat carriers, put in a cushy towel, bowl of water, and some food and proceeded to write “FOUND: Chicken” posts online. And I successfully found her people and returned her later that day. She was a beloved Sebright Bantam hen, very similar to my own little guy, Bitsy. She cuddled into her owner’s coat for the ride home.